Part 2: Webmaster and NinerNewbie Need Your Help!! Thanks to our family, friends, and the power of the 49erswebzone.com fans, Webmaster and NinerNewbie have made it into the top 10 for the MYfm 103.4 free Wedding in a Week contest. However, the contest is not over yet. Voting for the winner amongst the top 10 has started and these two still need your help. 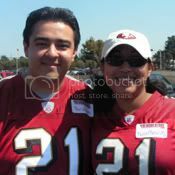 Webmaster and NinerNewbie are asking for members, visitors, fans and friends of 49erswebzone.com to cast their vote. Voting will take place over the next 4 days. The second part of the contest is choosing aspects of the wedding. Today's choices is the Wedding Honeymoon. While both sound good, NinerNewbie has sided with the Sandals Royal Bahamian Spa Resort & Offshore Island.